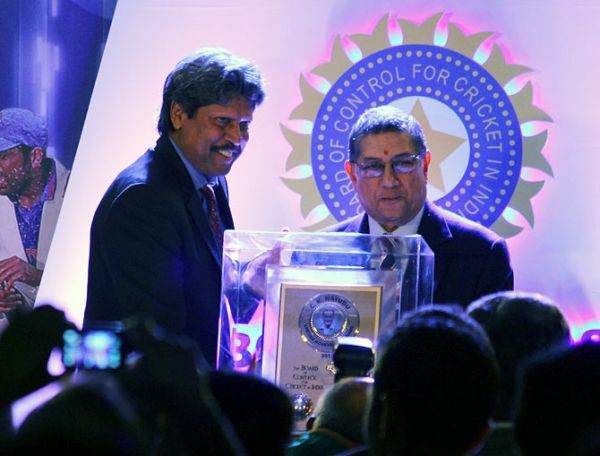 Former India captain Kapil Dev was honoured with the C K Nayudu 'Lifetime Achievement' award by the Board of Control for Cricket in India at its seventh annual awards ceremony in Mumbai on Saturday. Off-spinner Ravichandran Ashwin was bestowed the 'Polly Umrigar' award for being the best international cricketer last season. Ashwin starred in the 2012-13 season, during which he claimed 43 wickets, inclusive of four five-wicket innings and one ten wickets match, and scored 263 runs, inclusive of two 50's from eight Tests. He also grabbed 24 wickets from 18 ODIs, and three from four T20 Internationals. The 'Polly Umrigar' award comprises a trophy and cheque for Rs 5 lakh. The award was won in previous years twice by Sachin Tendulkar (2006-07 and 2009-10) and once each by Virender Sehwag (2007-08), Gautam Gambhir (2008-09), Rahul Dravid (2010-11) and Virat Kohli (2011-12). Legendary all-rounder and 1983 World Cup-winning captain Kapil became the 21st Indian cricketer to receive the 'C K Nayudu' award. "When we started playing, it was only for passion, as we didn't think about any awards. I would like to thank all the captains under whom I have played. Bishan Bedi, Sunil (Gavaskar), Venkat (S Venkataragahavan), Gundappa Viswanath. I would like to thank my family who allowed me to play the game for so much time. I believe all of us, including me, should feel proud for making the game popular in the country," Kapil said, after receiving the award. One of the greatest cricketers of all-time, Kapil was the first player to complete the 'double' of 5,000 runs and 400 wickets in Tests. 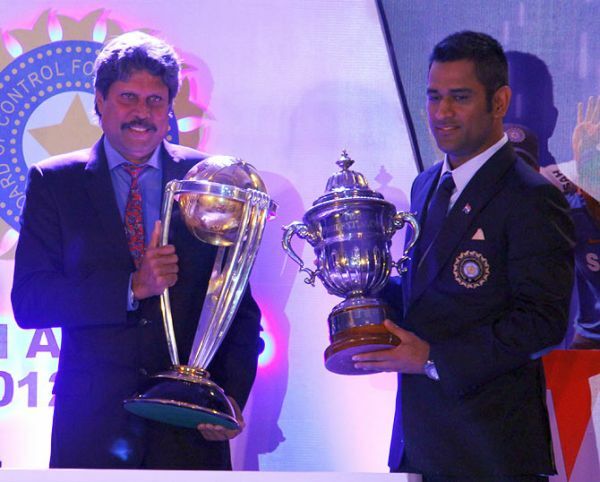 The most poignant moment of the short awards function was when Mahendra Singh Dhoni and Kapil were caught in the same frame posing with the Prudential Cup and ICC World Cup Trophy. Dhoni then handed the ICC World Cup Trophy to Kapil while the latter handed the Prudential Cup to Dhoni. Kapil's temperament and tenacity overshadowed his talent. He produced his best in crisis situations. He overcame an injured thigh to take 5 for 28 against Australia at Melbourne in 1980-81, which took India to a famous series-levelling win. His 119 against the same team at Chennai in 1986-87 steered India out of a tight spot, and set up only the second tied Test in the history of the sport. Against England at Lord's in 1990, with India needing 24 to avoid the follow-on, and the number 11 batsman at the other end, he proceeded to hit off-spinner Eddie Hemmings for four consecutive sixes and achieved the goal. He had a stint as coach of the Indian team in 1999-00, and served as chairman of the National Cricket Academy in 2006-07. 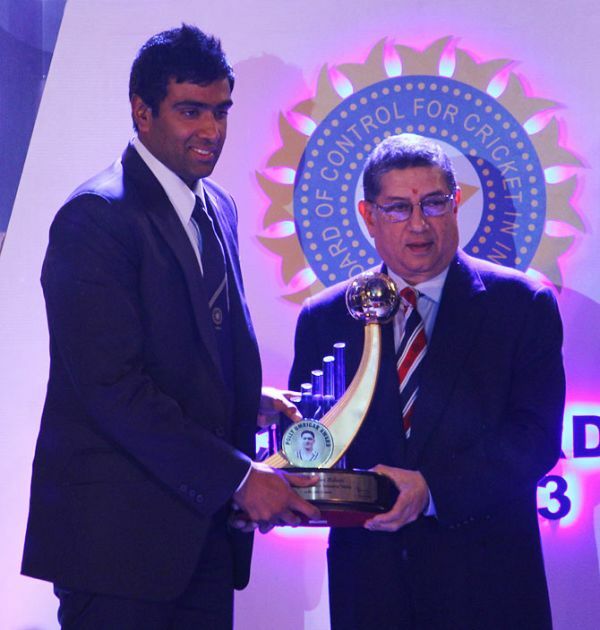 Ashwin said winning the award was a dream come true. "I am extremely blessed and honoured to be standing before you. This is the real dream come true. I thank the BCCI for honouring and recogising my performance. 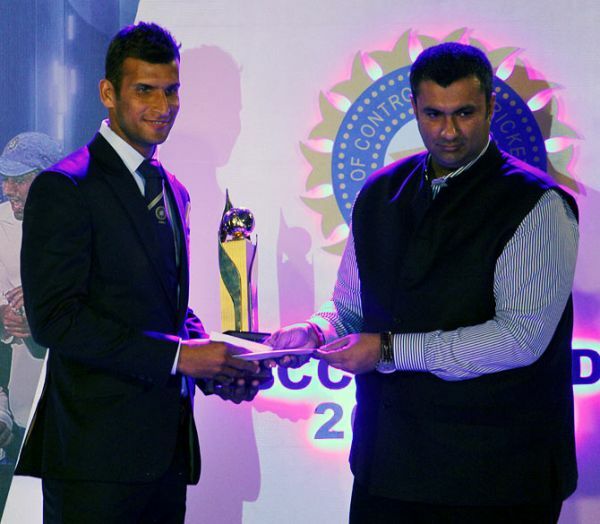 Mumbai's Abhishek Nayar received the 'Lala Amarnath' award, for being the best all-rounder in the 2012-13 edition of the Ranji Trophy. He scored 966 runs at 96.6, inclusive of three centuries and eight fifties, and 19 wickets at 22.8, inclusive of one five-wicket innings, from 11 matches, in the tournament. The award comprises a trophy and cheque for Rs 250,000. The Mumbai Cricket Association collected the trophy for the 'Best Overall Performance' in the 2012-13 season. The various teams representing the MCA won the Ranji Trophy, the Under-25 C K Nayudu Trophy, the Under-16 Vijay Merchant Trophy, the women's Under-19 Inter-State tournament, and finished runners-up in the Under-19 Cooch Behar Trophy. Rohit Sharma, who is in India's ODI as well as Test squad for New Zealand, received the 'Dilip Sardesai' award, for being India's best cricketer in the recent home Test series against the West Indies. He scored hundreds in both Tests, and accumulated an aggregate of 288 runs. The award comprises a trophy and cheque for Rs 500,000. The highlight of the function was the felicitation of three former stalwarts - R G (Bapu) Nadkarni, Farokh Engineer and the late Eknath Solkar - for their contribution to Indian cricket. Nadkarni and Engineer were not present, while Solkar's widow received the award, a memento and cheque for Rs 15 lakh each. Also present at the function were former India stars Sachin Tendulkar, VVS Laxman and Sourav Ganguly.